Kill List manifested itself to me in the form of a cautious recommendation pleading for me to remain in the dark. Not long after, the buzz of Kill List took form over the world wide web, brief mutters catching wind of the nonsensical musings of the finale, with so much brevity that visiting my favorite cinema news/review sites proved to be quite the obstacle course. I maintained my position and leaped at Kill List with my all once I noticed its humble emergence. With a cockney swagger, Ben Wheatley directs this somber hit-man drama with a creeping and fleeting eye for family values before thrusting our lead characters into their chore of killing, which at times, proves to be too much with both family and business in tow. Kill List follows the patriarchal rule of most darkly brewed British thriller/dramas with weaving two male British figures and their off-the-pot relationships and values while siding you against the cunty female denizens of unending mischief. In one corner we have Jay, our lead, a thought-upon British soldier who is bewildered by incognizant terrors from war time stress found from a blundered mission in Kiev; who knows what terrors lie in waiting hunger? In the other, we have his more chipper associate-sociopath, Gal, a Ray Winstone if I ever saw one and a through-and-thorough good pal. Together they make up the duo of "mechanics" who have been out of the wind for a decent bit as Jay is balancing financial coordination and family man all too close to each other, obliviously mixing business and pleasure since being off his rocker. Gal, on the other hand, seems all too ready for a new life, a new beginning, which makes up for his +1 to Jay's dinner get-together - a sharp featured brunette whose murky motives play out in horrifying grandeur. Subtle nuances clear the path for Kill List and keep it ambiguously fresh and enjoyable. Whether or not Wheatley intended for Jay & Gal's client to resemble a wispy-haired Angus Scrimm lookalike, the results scream in favor of a meditated casting decision. Proceeding after the occasional segments of "...what? ", Kill List regains its momentum as hit after hit are detailed in a sordid and grisly manner; almost as if Wheatley intended to channel the same drive that fueled the doomed lead of The Horseman (2008). It is alarmingly clear at the point when the first target is made known to Gal that the gut for taking ones life isn't something that can remain as fortified as a simple talent. We witness this with purpose when Gal is disturbed with the idea of executing an ordained priest - an act of business Jay isn't all too bothered seeing through to completion. Allusions of war are applied directly into the bowels of Jay's opening exposition with his family and friend. Wheatley must have decided that flashbacks would have muddled the sense of linear engagement in this tale of curveball carnage and in place, intermittently injected keywords into idle banter to give sense to it all and avoid a confusion possibly more serious than what the ending might offer to a casual viewer. 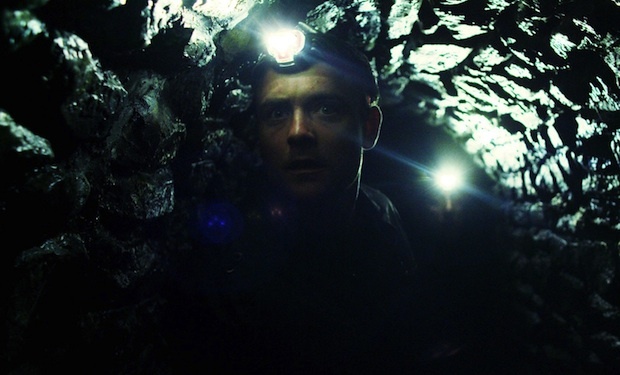 Kill List is a devious joker of cinema, to be quite frank. It ends on such a baffling note that the nearest emotion you might muster up would be a hybrid of anger and bewilderment, as if Kill List had a promise to fulfill other than living up to the elevated hype that has since clouded its release. While the end never seems to justify the means for Kill List and its godforsaken existence, the fate of its characters can be traced back to its opening roots, which speaks volumes in comparison to the brackish body of cinema excess that floods the senses of the modern viewer. A degree of difficulty can be found in distinguishing the indistinguishable diatribe of Kill List's choice British actors. I found myself constantly on edge tweaking the volume to an acceptable level only to thrash towards the dial when the frequent bouts of domestic disturbances exploded onto the screen, at rarely a moments notice as well. 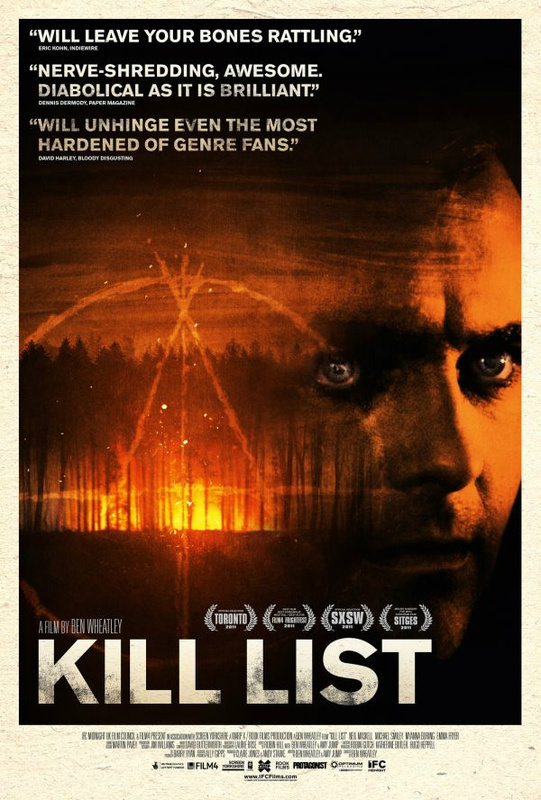 With each "victim" separated into chapters with an appropriately labeled title card, Kill List's pacing, if slow at first, propels towards such an even pacing that reliving the nightmare a second time in the company of friends proved most satisfying as I huddled into the corner, eyes darting to catch every expression that stunk of disbelief. Respected artisans of small-time acting, Neil Maskell and Michael Smiley, respond once the film begins with a spark of friendship that proves charming, even in light of the unexplained incident in Kiev that Jay suffered throughout. The chemistry between the two holds tight, even when Kill List spirals into a sort of inspired madness which must remain unknown until after the film has been ingested. Even the slightest hint of where Kill List draws its life from would go off and spoil one of the more alienating finales in recent memory. Upon my first viewing of Kill List, I admit I felt cheated; I felt myself conjuring a passive fury towards its proposed goal. But upon having it grace my screen for the second time, Kill List warmed its silly cinematic contraband towards my palate. Nonsensical antics in mind, a part of me welcomed in the clumsy culmination of this assassin thriller. While Wheatley handled what he intended to create and project with the elegance of a handicapped athlete, one cannot contest that after examining, scene-by-scene, the good grace of Kill List, that it doesn't reach its finishing line - Even if its visual and lyrical summary liken to a combined hypothesis of every great shocker rolled into one imperceptible package of imperfection. As an added bonus, within Kill List you will find several short glimpses of extreme savagery that had the visitors in my room twitching in repulsion. This more than makes up for the mild misdirection by assuming a role of a grotesque party favor, don't you think? This was barely released outside of England (thankfully) and even in its native UK it died a laughable death at the box-office, i always cheer with delight when that happens because its a sign that even the British movie going public are finally realising what a ludicrous pathetic joke the (so-called) British film industry really is. Oh stop being so cynical. Some of the best movies ever made come from these Isles FACT. Yes, it's true were not exactly prolific, but so what? We do fairly well considering.